The Darling Dogwood: Hey Hey, I'm a Monkey! Hey Hey, I'm a Monkey! 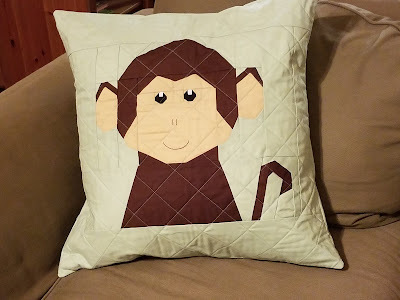 As I finished this pillow, I couldn't stop singing the theme song from The Monkees. And so a pillow is named! The pattern is part of the Zoo Animals bundle from Kristy @ Quiet Play. The Zoo Animals bundle includes 9 different animal blocks. I have plans to make the giraffe and the koala in the near future; some of the others may come at a later date. Her paper pieced pattern is for a 10" block; I enlarged it to a 16" block. I added more of the background fabric to make it fit a 20" pillow. I think some of those pieces around the eyes would be awfully tiny in a 10" block! My one disappointment with the pattern is that there was no instruction about adding the face. The picture showed what I am guessing was embroidery, but there was no guideline or written direction. I used embroidery, and I wished I used more strands to make the face show up better. The fabrics are Kona cottons in Chocolate, Scone, & Seafoam, with Black & White used in the eyes. I used a 20" pillow form from IKEA and the envelope pillow method from Amanda Jean @ Crazy Mom Quilts. Kangaroo is next, but I have a few projects I want to finish before I can hop to making that one. Here is the Monkey with its friend Panda. The monkey pillow was goal #6 on my list of Q4 goals in the globally hosted Finish Along. 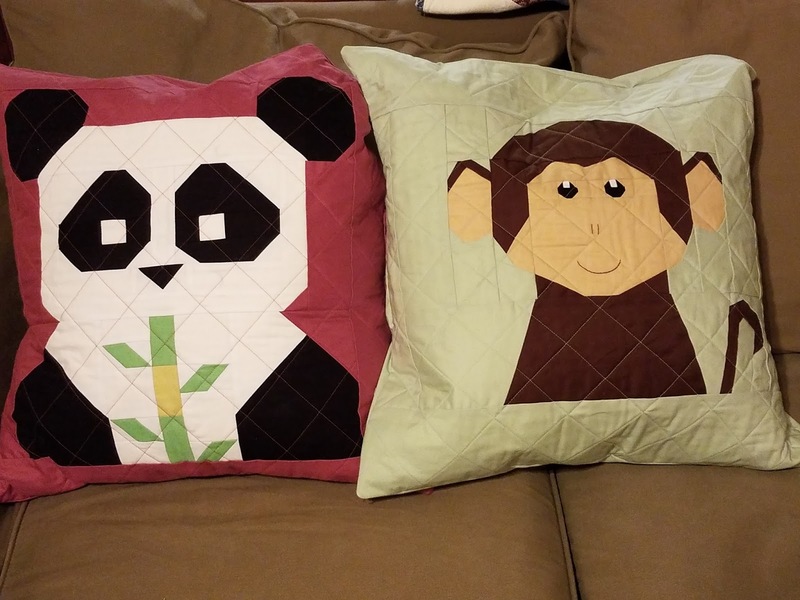 These are really nice pillows, I love the panda especially! And thanks for the earworm! Lovely cushions, I love monkey, there again I really love panda, on the other hand giraffe did you say? So CUTE! Can't wait to see the Roo too! The monkey is so cute!!! And the panda too - well done! These are even cuter in person! I Spy a finished quilt!